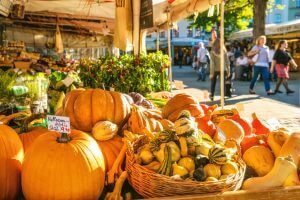 A farmers market is one of the best ways to get to know a new city! Farmers markets of Minneapolis and Saint Paul are all Minnesota grown, and they know how to give Minnesotans a great experience no matter the season. Stroll around the markets on a beautiful summer day, enjoy a windy fall Sunday sipping cocoa, and look for blooming spring flowers at these top 6 Twin Cities farmers markets! Heading out to the farmers market is one of the most popular summer outdoor activities in St.Paul! This market has everything you’re looking for— from fresh produce, to baked goods, and plenty of people-watching opportunities. You’ll be experiencing history, too, as this was the first public market in St. Paul — established in 1853! The market is located in Lowertown, near the CHS field in the heart of Minnesota’s charming state capital! The market is an easy walk from many trendy affordable housing options, urban restaurants, coffee shops, and brew houses alike. This large Twin Cities farmers market is a little cousin of the Minnesota State Fair with an abundance of delicious foods. Stock up on the fan favorites — from sweet corn to Minnesota-grown herbs and spices. Feast your eyes and your stomach on a hearty selection of brats, steaks, and cheeses. Don’t be afraid to splurge a little on the homemade breads and baked goods, either! Featuring live music and savory dishes, the Midtown Farmers Market is one of the fastest-growing markets in the state. Shop the natural produce and find a vast selection of local honey and jams in a variety of unique flavors. There are over 80 local vendors who bring in fresh produce, ready-to-eat foods, as well as jewelry, dinnerware, and other crafts. For something a little different, we recommend checking out the market favorite, Tooties Peanuts for their famous southern-style peanuts! So if you’re looking for things to do in St.Paul or Minneapolis this weekend visit the Midtown Farmers Market for some delicious roasted, cajun, or brown sugar peanuts. The Mill City Farmers Market is located in one of the most scenic spots of the Twin Cities, right on the edge of the Mississippi River, and adjacent to the famous Guthrie Theater. They are a zero-waste market, and their farmers supply organic veggies, fruits, herbs, spices, eggs, meats, cheeses, and so much more. If produce doesn’t do it for you, you can browse the variety of body care products, get apothecary medicines, homemade soaps, bee candles, and more. Then, check out their selection of arts and decor! If you’re looking for a wide market variety and a scenic stroll, there’s no better pick than the Mill City Farmers Market. It also makes for a perfect date spot or showcase location for visiting family and friends! The Minneapolis Farmers Market has locations at Nicollet, the Government Center, and our REE choice favorite: the Lyndale Market. The Lyndale Minneapolis Farmers Market was also chosen as the best farmers market in Minnesota by Best Things Minnesota! Vendors sell anything from fresh brats, to a rainbow of veggies, decadent olives, oils, pastries and everything delectable. Get interactive at this farmers market on Saturdays with lessons and tips from local chefs and enjoy live music as you roam around. Shop pumpkins, holiday trees, and decor in the colder months, and vibrant flowers in the spring and summer. Their year-round daily operation means you can spend any day enjoying fresh produce and “Minnesota Nice” vendors no matter the season. Their weekly market brings together non-profit organizations and local vendors alike! Their lineup has grown over the years and now includes food trucks, live music, and children’s activities. Of course, the market is full of zero-waste organic vendors selling seasonal produce to enjoy! The Northeast Winter Farmers Market is more than your average farmers market experience with live music, local beer, a bloody mary bar, and over 30 local vendors. Minnesotans need somewhere to enjoy local fresh flavors and fun activities for the long cold winters — thankfully, the Northeast Farmers Market has you covered! The East Isles Farmers Market is a quick ride up the Midtown Greenway trail from Lake of the Isles itself — it’s the weekday farmers market option for a casual Thursday evening. It opened up in June of 2018, making it the Twin Cities newest farmers market! It’s the closest farmers market to the heart of Uptown. It’s focus is on establishing green spaces and showcasing local farmers, bakers, and craftsmen alike. Their unique feature is the “Pickle Booth,” where anyone from the community can sign up to showcase their popular recipes. It doesn’t have to be a pickle, either; the East Isles Market wants to help you show off that one special dish you make. The one that everyone tells you “WOW, you’d make good money selling this.” Now is your chance to find out how! While you’re out enjoying some of Minnesota’s friendliest markets, you may start to consider how great it would be to live in one of the vibrant neighborhoods they’re hosted in. Find out which apartments and townhomes are up for grabs, and maybe soon you can make a Twin Cities farmers market your grocery go-to every week!